Jack Ellsworth started with a rock ridge in the wilderness and created a work of art. 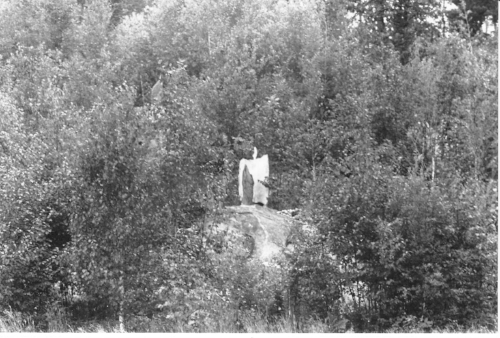 Beginning in 1944 and over the course of 20-plus years, Jack built rock-walled garden beds, pathways, sculptures, architecturally interesting structures, and directional features to form the “Showplace of Kabetogama.” Jack’s creation was intriguing to many and people visited Ellsworth Rock Gardens by the thousands. Due to poor health, Jack Ellsworth never returned to his cabin and rock gardens after 1965. The forest slowly recaptured the rock formations and, by the time the National Park Service purchased the property from Jack’s widow Elsie in 1978, only a few statues were visible among the trees and shrubs. Yet, the allure of Jack’s masterwork endured and people continued to visit the gardens in the summer. In 1996, after pressure from the local Kabetogama Lake community, park staff began removing trees and shrubs from the gardens. Since the first “Garden Blitz” in 2000, staff, contractors, and volunteers have repaired statues and rock walls and buildings, continued to remove non-historic vegetation, and replanted historic flower varieties. With the help of volunteers, work continues each summer to restore and preserve Ellsworth Rock Gardens. Slowly, Jack Ellsworth’s concept is re -emerging. Changes will be taking place at Ellsworth Rock Gardens starting June of 2018. In the works is a two-year project that will improve visitor accessibility, provide better information about the history of gardens, and increase dock space. The dock system will be moved to a location that is closer to the Ellsworth’s original dock which will enhance sharing the story of the site. This year, phase 1, will include construction of an accessible comfort station, accessible path to the picnic shelter, and development of interpretive media. The new dock system will be completed by spring 2019 and Jack’s gardens will continue to charm and welcome a wider audience. All current facilities will remain open throughout construction. Funding from Voyageurs National Park Association and its generous donor community will be used to support some of the restoration and visitor education elements of this Ellsworth project. This spring, Voyageurs National Park maintenance staff constructed a new picnic area on the lawn of the Ash River Visitor Center that is accessible to all. The new picnic area has two accessible picnic tables and an accessible fire ring for visitors to enjoy a lunch or just have a fire and enjoy the evening. The Ash River Visitor Center sits on top of a rock ridge overlooking beautiful Kabetogama Lake with views to the east and west. The previous picnic area was located on a point below the visitor center with a steep incline that was difficult to access. The Ash River Visitor Center is located in the historic Meadwood Lodge. Take a moment to explore this historic, rustic building. There is a bookstore, a children's activity corner, exhibits, a small theater, and a staffed information desk. Programs are sometimes offered as staffing allows. There is a free public boat launch and separate paddle access area are available.The Ash River Visitor is closed from late September - late May. The Ash River area is accessed off Highway 53 just south of the Kabetogama Lake turn-off. Drive on the scenic Ash River Trail (County Road 129) . A new National Park Service (NPS) report shows that 237,249 visitors to Voyageurs National Park in 2017 spent over $18 million in communities near the park. That spending supported 273 jobs in the local area. "The environment of northern Minnesota is integral to our economy in so many ways. Assuring we have places like Voyageurs National Park to provide a way to escape to and connect with our environment is vital to our economy as well,” said Superintendent Bob DeGross. The peer-reviewed visitor spending analysis was conducted by the U.S. Geological Survey and the National Park Service Environmental Quality control economists Catherine Cullinane Thomas, Lynne Koontz, and Egan Cornachione. The report shows $18.2 billion of direct spending by 331 million park visitors in communities within 60 miles of a national park. This spending supported 306,000 jobs nationally and had a cumulative benefit to the U.S. economy of $35.8 billion. It is with great pleasure that VNPA announces the addition of two new board members: Carl Numrich and Matthew Mueller. Both of these individuals are poised to offer their experience, enthusiasm, wisdom and commitment to public lands and protecting Voyageurs National Park. Carl Numrich joins the board as an associate attorney at Fredrikson & Byron P.A., a firm that has supported VNPA through pro-bono services, volunteer leadership, and grant funding over many years. Carl brings to the board his legal expertise, commitment to giving back to the greater Minnesota community, and a desire to help VNPA continue to grow. Matt Mueller has been involved in the commercial property and casualty insurance industry for over thirty years. He is the founder, and currently serves as the president of Berkley Technology Underwriters in Minneapolis. With his organizational and business development skills, Matt strives to make the state of Minnesota a great place to live, work, play and visit. Matt has visited 30+ national parks so far, but you will always find him at least one week out of the year pursuing Northern Pike on Rainy Lake. Spring might be the quietest season in Voyageurs National Park. The snow and ice have melted enough to prohibit snowmobiling, but fishing opener has not yet started. For a short period, the park is free from the drone of the boats and snowmobiles, and the wild qualities of this vast land can be sensed by sight, sound, and smell. I love spring in Voyageurs because of this. In early April 2014, when I started my first field season working at Voyageurs, I arrived at park housing by the Ash River Visitor Center where I lived for a month. I quickly realized that there was not a soul around; there were never any cars at the Ash River Visitor Center parking lot, there was a foot of ice on the lake still, and when I hiked the Kab-Ash or Blind Ash Bay trails I never saw other footprints in the remaining patches of snow. Here I was in a national park and I had it all to myself! Most nights during April, I would walk down to the rocky point by the Ash River Visitor Center and sit on the barren rock, watch the sunset, and absorb the sounds of spring. The warm glow of the sinking sun on my face during these calm spring evenings was reason enough to come to the point every night. Yet there was a stillness and silence across the land that was particularly intoxicating and satisfying. There is immense peace and contentment found when listening to the wild unimpeded, when detecting the minute sounds of the forest. Sadly, I have found so few places in the world that I can still experience the natural world without the sounds of people or their machines. Often on the point there was a robin who would perch in the top of a tall, lanky spruce and sing with a joyful warble. The robin’s song would echo across the icy lake and far away I could hear several other robins adding their song to the silence. When the robin would stop, I could hear the soft tinkle of thousands of small ice shards dropping from the thick ice sheets that had been pushed up on the rocky shoreline. A few red squirrels over by Lost Lake seemed to argue with one another each evening, using their long high-pitched shrills and barks to state their discontent. During dusk, a saw-whet owl would sound from a shoreline across the icy desert with its eerie too-too-too call. Every once in a while, a sudden large crack would rip across the frozen lake as the ice sheets battled the spring thaw. One evening, I laid down on the sun-warmed rock and closed my eyes just to listen and breath deep the cool northern spring air. All the cares of life just seemed to slip away for a few minutes, for a brief second I was part and parcel of the wild north. For a while as I laid there I became envious of the people who for thousands of years lived not separated from but in the natural world; I was envious of the Voyageurs who saw the lands of the park when the towering pines still stood and the caribou roamed. I wonder if these canoe men ever considered that the wild places they traversed might one day be irreparably changed. After a while, I opened my eyes and far across the ice I could see a red fox dancing along the shoreline. Although the animal and plant life of Voyageurs might be different today, the protection of this land as a national park has preserved some of the eternal qualities—such as the silence and wildness—that have existed since the formation of this land eons ago. During the busy seasons of summer and winter these qualities can be elusive at times but in the spring the quiet can still be heard, but more importantly, it can be felt. One has only to come sit on the point near Ash River in April and be still. There you can experience the land of old, sense the majestic silence, and be touched by the glowing sun. Voyageurs National Park is no longer recommending travel on frozen lake surfaces within the park. Due to warming weather and lack of snow; ice conditions are deteriorating, standing water is appearing on frozen lake surfaces, and bare ground is appearing on the safety portages. Park trail markers and hazard signs are no longer able to remain upright so park staff have begun the removal of those markers. The Rainy Lake Ice Road, Kabetogama Lake Ice Road, and all snowmobile routes are closed. Other winter recreation trails in Voyageurs National Park are no longer being maintained. Visitors are welcome to come and hike the Oberholtzer Trail and the Rainy Lake Recreation Trail as conditions permit. Park staff would like to remind visitors the Rainy Lake Visitor Center remains open Wednesdays through Sundays, 10:00 am to 4:30 pm. Thank you to all Voyageurs National Park visitors for making this a safe and enjoyable winter season. It was the first day of 2018 and I was excited to get the new year off to an adventurous start by getting outside and doing some exploring. It had been a cold end to 2017 with temperatures in the last week of the year bottoming out at -37F. With a forecast high of 0F, I wanted to enjoy some of the relative “warmth.” I layered my clothing and packed up my gear: my skis, poles and lumbar pack with snacks, map, warm water (so that it wouldn’t freeze), and ice picks. When I reached the parking lot at the Kabetogama Lake Visitor Center boat ramp, it appeared I would have Voyageurs National Park all to myself; not a single other vehicle was parked there. I strapped my boots into my ski bindings and set off. It was a cold start to the day at -19 and my skis didn’t seem to glide very well on the crusty, wind-blown snow. I picked out landmarks across Kabetogama Lake to guide my way to my destination: Ellsworth Rock Gardens about 4 miles distant. My first landmark was a distant Sugarbush Island. As my skis warmed up through the friction of gliding across the snow, they seemed to slide a bit more easily. Soon enough I found myself in between 3 islands, Sugarbush Island and an unnamed island to my right and Harris Island to my left. I stopped for a short break in the relative shelter of the islands, and then continued on to my next landmark, the southeast side of Cutover Island. Every now and then I would pick out some animal tracks in the snow. Wind had obliterated most to the point where they were unrecognizable, but I was able to identify a few wolf tracks, unmistakable in their size. As I rounded the south side of Cutover Island a wooden boat dock came into view; I was nearly at Ellsworth Rock Gardens. I arrived at the rock gardens to find that I was the first human visitor in quite some time. The only footprints in the snow belonged to animals, mostly foxes and deer. I trudged through the snow and admired the art. Some of the boulders that Jack Ellsworth used in creating his sculptures must weigh several hundred pounds. It must have been hard work moving them around. As much as I wanted to spend more time at the gardens, a cold wind was starting to blow. It was time to move on. While Jack Ellsworth was never at this site in the winter, the brutal cold got me thinking about another group of people who may have spent their winter at this site, though before there were any rock gardens here. 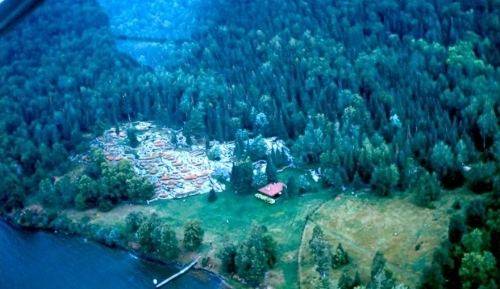 Where the gardens now sit, was once the site of a logging camp. Winter was prime time for logging in the North Woods. No biting insects to contend with and a nice frozen surface where there had been swampland in the summer. Was the logging camp that existed where Ellsworth Rock Gardens now sits a winter camp? We don’t know for sure, but it seems logical that it was. I imagine the loggers working here in the extreme cold, felling trees with crosscut saws and moving them by horse drawn sleigh to the shores of Kabetogama Lake where they would be floated in huge booms to the sawmill come ice out. I imagine the trip back to their crude log bunkhouse after a long day in the woods. Think of what a welcome sight and feeling it would be to warm up inside the bunkhouse by the hot stove and eat a hearty meal in the camp dining hall. The thought of it was getting me thinking about making my way back to my own warm home, and so I made the ski back across Kabetogama Lake to my car for the drive home. As I drove I reflected on what I had seen on that day and thought about all the changes that had happened to the lands where Ellsworth Rock Gardens now sits. We know about the logging camp and the gardens, but we don’t know what was there before. Did anyone live there before the logging camp? Perhaps an Ojibwe family once called the area home. If so could they have ever envisioned what the site has become? And what does the future hold for this interesting spot on the northern shore of Kabetogama Lake? 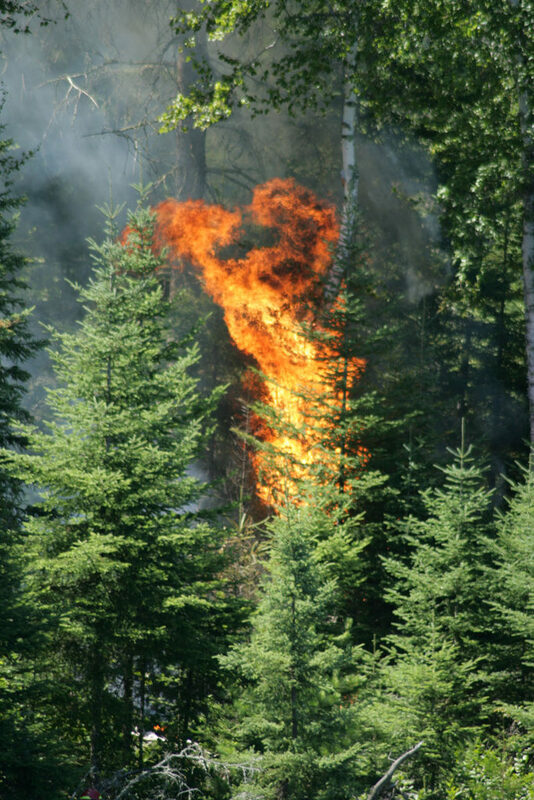 I was working a wildland fire in the Boundary Waters in the summer of 2006. My crew arrived late in the fire and was responsible for a lot of mop-up operations. One day during a break I was sitting on the steps waxing my boots to keep them water-proof. The incident commander walked by and paused as he saw what I was doing. During that pause I briefly wondered if I was in trouble. He then said, "A lot of times it is not about what we've done as what we are prepared to do," and then he walked off. That comment has stuck with me for the last 12 years because it captures the essence of my job. I am a park ranger in the Visitor and Resource Protection Division which means emergency response, among other things. Emergencies have included wildland fires, snowmobile crashes, broken arms, lost boaters, capsized boats, hazardous material spills and a variety of law enforcement situations. Nobody wants an emergency to happen. Nobody can predict when an emergency will happen. The best we can hope for is that we are available and ready to respond when the call comes. That comment from 12 years ago means that you are ready to respond. Whether or not a call comes, being ready is a mark of doing the job right. You must prepare your mind, your body and your gear. Getting adequate rest is critical for alertness and good decision making. Proper nutrition gives you the energy you need and lends to good health. Appropriate and regular training keeps your skills sharp and your confidence high. Keeping your boots waxed makes them waterproof so you are ready to hustle down the trail no matter what puddles lie ahead. Of course, there is more than just boots to take care of. You never know when the next call will come. It might happen before you've finished the paperwork from the first emergency. Equipments is always made ready immediately after being used. Make sure the snowmobile is fueled up, the truck tires are inflated, the medical bad is re-stocked, the tow line is dried and neatly coiled, put fresh batteries in the flashlight and sharpen that knife. Or, it could be several weeks before the next big emergency. Emergencies don't happen every day and a break can be nice. This gives you chance to congratulate the sportsman on their trophy fish or hear the camper's tale of a visiting bear. But, there is a challenge to remaining vigilant as time goes by. The need for training seems less urgent, and you get assigned other tasks to keep you busy. Pretty soon you are so bogged down with chores that you failed to stay ready. you feel interrupted when the emergency call comes. As a ranger, I routinely hear visitors say "Boy, you've got a great job! I always wanted to be a park ranger!" I'm sure other rangers hear this too. I wonder how many of them just nod and smile like I do. I wonder if the visitor realizes just how much time and effort it takes to stay response ready. Being reading isn't only about getting your chores done on time. It is a state of mind. It's a way of life. I guess visitors are right, because it is a great life. For all of those who wanted to be a ranger but never did, "Keep your boots waxed!" "The beauty and charm of the wilderness are his for the asking, for the edges of wilderness lie close beside the beaten roads of present travel...through the northern forests, the home of the giant moose, the forests of fragrant and murmuring life in summer, the iron-bound and melancholy of winter. The joy of living is his who has the heart to demand it"
Few that ever come to Voyageurs wander down the more than 20-some-mile long Kab-Ash Trail that runs from the resort community of Ash River and ends near Kabetogama, Minnesota. The Kab-Ash is the only large trail network in Voyageurs National Park that can be accessed year-round without a boat. The trail only has a few access points and typically the conditions during the summer—when most visit the park— are buggy, hot, and humid. Further the verdant Minnesota summers quickly swallow the trail in vegetation as the Kab-Ash is not regularly maintained throughout the summer. Given all of this, few ever use the trail making it an ideal path for those who crave a true wilderness experience. Over the past 3 years, I have hiked, for both research purposes and recreation, more than 200 miles on the Kab-Ash. Though the Kab-Ash trail does not have the scenic overlooks of famous trails in other national parks, it has a subtle magnetism and beauty—a beauty that is only found when spending time in seldom-visited wild places. There is no doubt that the Kab-Ash is a wilderness trail. You almost certainly will not see another soul when on the trail and the miles of thick forests surrounding the trail stifle the sounds of the modern world. Indeed, once you get away from the trailhead the only sounds you will hear are the wind whispering through the weathered tops of the pines, the red squirrels alarmed by an intruder, and the gentle notes of birds all around. As a result, the Kab-Ash is a refuge of sorts, a place for reflection, contemplation, and introspection, a place to ponder the natural cycle of every living creature, to wrestle with the struggles of one’s life. On several days when I have simply needed to think and consider, I have rambled down the Kab-Ash for a few miles and mulled through the thoughts that were troubling me. Sometimes, I would just sit down at the base of a towering pine or on the roots of some ancient cedar, and be still. Sit, listen and observe. There is something refreshing and intoxicating about being a silent observer in a world where your problems or struggles are irrelevant, where life goes on the same day after day with or without you. Indeed, the eternality of nature provides a certain clarity regarding the brevity of our own lives and the often inconsequential nature of the problems we face. The open rock ridges of the Kab-Ash are particularly beautiful in the fall. Yet, it is the wild and natural aspects of the Kab-Ash which facilitate its emotional value to wanderers such as myself. From one walk down the Kab-Ash, one could experience almost every habitat type in northern Minnesota and for this reason I would argue that the Kab-Ash, more than any trail in the park, is a perfect representation of the incredible diversity of forest and wetland habitats that Voyageurs National Park protects. Indeed, the Kab-Ash goes through the iconic mixed forests (coniferous and deciduous trees) of the northwoods, over red pine covered ridges (which are not common in VNP), through dark primordial cedar lowlands, across large sparsely vegetated barren rock ridges, around beaver ponds, through black spruce, tamarack and leatherleaf bogs, and along some stunning aspen and birch stands. Due to this large variety of habitats, incredible numbers of birds can be seen or heard during the summer on the Kab-Ash. Warblers, finches, and vireos fill the treetops of the upland forests while the thrushes and veeries seem to hide in the darker, more secretive areas. On a calm June morning just at sunrise, the sound of bird song on the Kab-Ash—or any area in Voyageurs for that matter—can be almost deafening from the multitudes of winged sentinels welcoming in another northern day. I am always left with a sense of splendor and wonderment when witnessing such vitality and vigor from these small creatures. How they make the woods seem to boil with life! Many of the park’s larger residents also occupy haunts along the Kab-Ash, and though seeing them is rare, often some sign of these animals can be found. When snowshoeing on the Kab-Ash, I almost always see fisher, marten, and fox tracks in the snow. The foxes, it seems, like to use the Kab-Ash to travel as I have followed fox tracks for over a mile on the trail. In June 2016, I saw a female porcupine with a small porcupette (a porcupette is a baby porcupine) on the Kab-Ash, which was the first time I had ever seen a porcupette. Although uncommon, moose tracks can be found on the trail from time to time. In late summer, when the blueberries are ripe, some bears head for the large rock ridges that the Kab-Ash crosses over to eat berries. The blueberries are incredibly abundant in these places (another great reason to hike the Kab-Ash!) and thus these ridges are likely an excellent place for bears to start gaining weight for winter. Beavers commonly dam up the small creeks that the Kab-Ash crosses. There is a quaint woodland creek with a small foot bridge that crosses the Kab-Ash about 2 miles from the trailhead at the Beaver Pond Overlook. For the past 3 years the creek has quietly flowed out of a large black spruce bog, across the Kab-Ash, down a steep hill, into another beaver pond, and then into Lake Kabetogama. In summer 2017, however, a brave beaver or two worked their way up the steep hill, dammed the creek, and created a new pond about 100 yards from the Kab-Ash. A new beaver pond, created during summer 2017, about 100 yards from the Kab-Ash trail (photograph taken in late October 2017). Then there are the wolves. Many come to Voyageurs and other parts of northern Minnesota excited about the prospect of seeing a wolf, which often does not happen (I studied wolves all last summer and only saw 1 wolf during this period and it was crossing the highway). Although your odds of seeing a wolf are extremely low on the Kab-Ash, wolf sign generally abounds, especially in the winter. The Kab-Ash goes right through the heart of two wolf packs— one that occupies the area east of Daley Bay and west of the Meadwood Road (the road to the Ash River visitor center), and another that occupies the area west of Daley Bay. In the summer wolves use the trail to get around their territory and while doing so commonly deposit scats (wolf turds) on the trail. And though you might not see a wolf, you could hear one. In 2015, I heard wolves howling off the Kab-Ash trail several times during the summer. In the winter, there are almost always wolf tracks somewhere along the Kab-Ash. In fact, I have yet to hike the Kab-Ash in the winter and not find wolf tracks. Just a few months ago in late October 2017, after a fresh snow, I was following a set of fresh wolf tracks down the Kab-Ash. The tracks veered off the trail, crossed the newly created beaver dam mentioned above and went over the beaver lodge where the beavers had been busy working the night before. I am guessing the wolf was hoping he could find an easy, free meal! The most incredible area of the entire Kab-Ash, however, has remained seemingly undiscovered or at least unknown to almost everyone. When I first found this area on the section of trail just south of Irwin Bay I was in awe and beside myself for days. There, among the Voyageurs forest, a small grove of monstrous, old growth white pines with one giant, ancient white spruce. 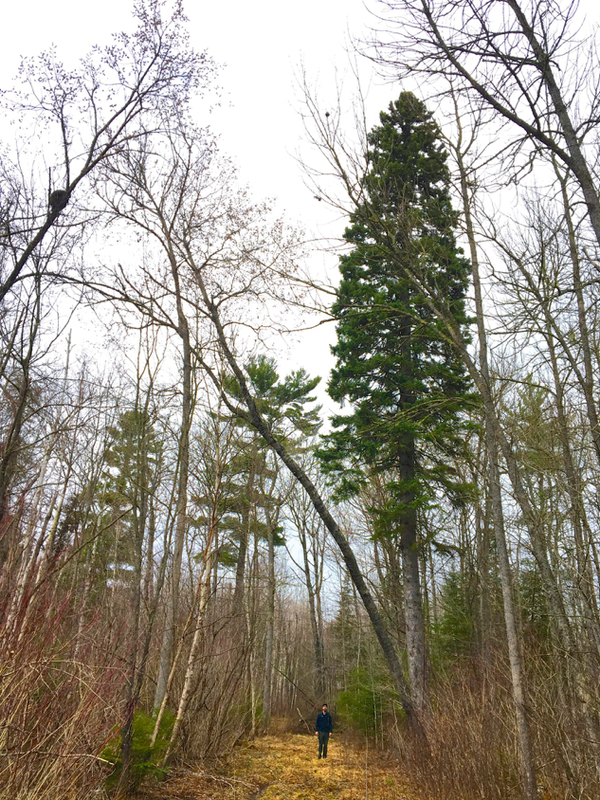 In total, I identified 8 white pines in a few hundred feet that were all over 4 feet in diameter, with one pine that had recently died measuring a staggering 5 feet in diameter. It is hard for me to put into words my feelings when standing next to these trees…I think one simply has to experience it. Based on some measurements, I estimated the trees were >300-400 years old. Consider that…these pines are probably older than our country! Moreover, these trees were almost certainly around in the days of the Voyageurs and perhaps could even hear the Voyageurs’ song as it danced across the water! Amazingly, for some reason almost a century ago, these old-growth trees were spared from the saw. I like to think that an old grizzled lumberjack, reflecting on the plight of the northern forests, left this stand for posterity and for others to enjoy decades after his time. After my discovery, I asked some park staff if they were aware of this grove of giants but could not find anyone who knew of this place. Though the grove is about 4 miles from the nearest trailhead, the reward of seeing these trees is worth all the effort. Thoreau shared a similar sentiment regarding majestic trees, exclaiming, “I frequently tramped eight or ten miles through the deepest snow to keep an appointment with a beech-tree, or a yellow birch, or an old acquaintance among the pines”. A monstrous white pine, estimated to be more than 300-400 years old, just off the Kab-Ash south of Irwin Bay. This pine is part of an old-growth stand that has remained seemingly undiscovered or at least unknown to almost everyone for many years. If there is one spot you should hike to on the Kab-Ash, this is it. As aforementioned, the Kab-Ash traverses a variety of different habitats with unique and specific characteristics based on the topography, moisture, and soil type, which all influence the plant and animals that live in these areas. When starting at the Beaver Pond Overlook trailhead heading west (I have omitted discussing the ~3 mile stretch from the Beaver Pond Overlook to the community of Ash River), the path works its way around the well-known beaver pond and then climbs and descends several small rocky ridges covered with majestic white pines and blueberry bushes. The trail then reaches the first of several “loops”. You can either take the south or the north section of the loop. I suggest taking the south section first (take the north section on the way back) which climbs up a large granitic ridge covered in scrub oak, some weather-beaten pines, and vast amounts of blueberry bushes. The best views on the Kab-Ash trail are on this ridge and in certain spots you can look south for miles upon miles (this is especially true during winter when the leaves have dropped). The trail then works its way down the backside of the ridge through a jack pine and spruce forest before winding around a black spruce bog and the new beaver pond that I mentioned above. After passing the new beaver pond (and the creek that runs out of it and under the Kab-Ash), the trail continues for almost a mile through predominantly balsam fir and aspen forest before reaching the second loop of the trail. However, in this stretch the trail also crosses some dense red pine covered ridges and follows a boardwalk that meanders through a cool, mossy cedar lowland. There is also a giant white pine about 300 ft north of the trail in this section. It is hard to describe where exactly but you can see the pine towering above the rest of the forest if you look carefully. At the second loop, I suggest taking the southern section which slowly climbs a large rocky ridge. Eventually the trail reaches the top of the ridge where there are scattered jack pines, blueberry bushes, and open rock faces. If you reach this section you are about 5-6 miles from the trailhead. This area is quite remote and I suspect only a handful of people ever actually hike this far down the trail each year. In 2015, this area was used so little that a wolf pack established a rendezvous site (a place where the pups are kept in the summer while the adults go out to hunt food) on the rock ridge right next to the cairns of the Kab-Ash trail. After reaching the open rocky area the trail quickly descends down the ridge into the forest, curls around a beaver pond that is in a valley (by Minnesota standards) between two large rock ridges, and quickly starts to ascend the next big ridge. Once you get up the rock ridge, you reach the third loop on the trail. Again, I suggest taking the south loop which weaves and winds across the open granitic ridge top for about 0.3-0.5 miles. The trail then slowly descends, for about 0.5 miles, into white pine, birch, aspen, and balsam fir forest and before long the trail flattens out for about 1-1.5 miles as it goes through mixed forest lowlands. In the springtime this section can be quite soggy, however, there are some magnificent white spruce trees on the west side of the trail. In one spot, there are 5-6 lumbering spruces within a few feet of each other which is the largest grove of “big” spruces I have seen in the park. At the end of this section is a long (>100 ft) bridge that crosses the east fork of Daley Bay. The bridge is a great spot to take a break and enjoy the scenery. Waterfowl such as ducks, geese and swans love this part of Daley Bay, and there is a beaver lodge close by the bridge where beavers are often out swimming around. The bridge that crosses Daley Bay is an excellent place to observe waterfowl and take in the evening sunlight. After the bridge you continue down the trail through more lowland forest. Keep your eye out for an enormous aspen, about 3.5 ft in diameter, right next to the trail…I have measured a lot of aspen trees in VNP and few even come close to the size of this aspen. About 1 mile from the bridge the Kab-Ash intersects a snowmobile trail. If you continue straight ahead after crossing the snowmobile trail you will quickly reach the trailhead for the Kab-Ash on Ash River Trail Road (i.e., a parking lot). However, if you want to continue hiking more of the Kab-Ash, then turn west and follow the snowmobile trail until it crosses, via a small bridge, the west fork of Daley Bay. Just a warning, the snowmobile trail is swampy as you get closer to the west fork of Daley Bay so use caution. One misplaced step and you might have wet feet for the rest of your hike. Right after you cross the bridge over Daley Bay, keep your eye out for the trail which veers north off the snowmobile trail. The trail is poorly marked in this area but it is no more than 30 ft to the west of the bridge. Once on the trail, you will walk along Daley Creek through largely white spruce, balsam, and aspen forest. I find this section of the trail to be a very peaceful, tranquil stretch. The trail eventually ascends some small aspen and pine covered ridges before reaching a marvelous section of the Kab-Ash: the bog. 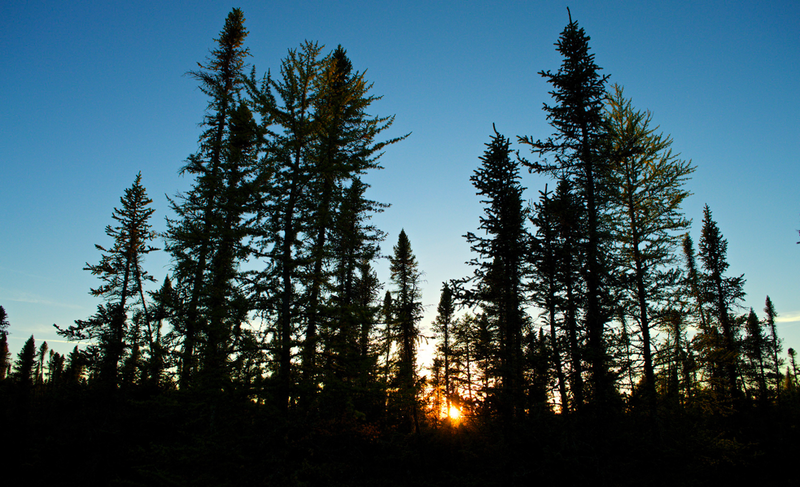 An intimate view of a black spruce bog which are common in Minnesota. Bogs are very hard to walk through during the summer but luckily the Kab-Ash has a long boardwalk that goes through a bog which allows hikers a close-up look at one of Minnesota's most unique ecosystems. Bogs are wet, soggy, hard to access places that have unique plant communities and are immensely beautiful. Fortunately, the Kab-Ash has a half mile of boardwalk that takes travelers right through the heart of a bog. The boardwalk weaves around mounds of sphagnum moss and Labrador tea, across black spruce and white cedar roots, and through stretches of tamarack forest. For a little while, you can experience a world that does not appear to change, a primordial place beyond time’s reach where the forest seems, per Gordon Lightfoot, “too silent to be real”. The boardwalk through the bog does not appear to have been maintained in some time and in some areas the boardwalk floats up and down with the water level in the bog. I have crossed this section multiple times and kept my feet dry in hiking boots. However, exercise caution when crossing this section and go slowly as the boardwalk is often damp or covered in water, and therefore slippery. Nonetheless, this is one of my favorite sections to hike and there is no other place in Voyageurs where you literally walk through a bog and see it from the inside out. Snowshoeing down the Kab-Ash is an excellent way to see Voyageurs and experience the splendor of winter. The trail then meanders through some rocky mixed forest woodlands until climbing a peaceful red pine covered ridge—a place that has an ethereal, almost heaven-like, quality when warm beams of sunshine slip through the red pine boughs and illuminate patches of forest below. I think it does the soul well to sit in places like this for a few moments to soak in the wonder; akin to Gordon Lightfoot’s sentiments, “Just for now I’d like to rest in the shade of a maple tree, to the blue Canadian sky I’ll say a prayer for the world out there”. After the ridge, the trail flattens out and follows the base of a fair-sized rock ridge to the north through an aspen and birch forest. 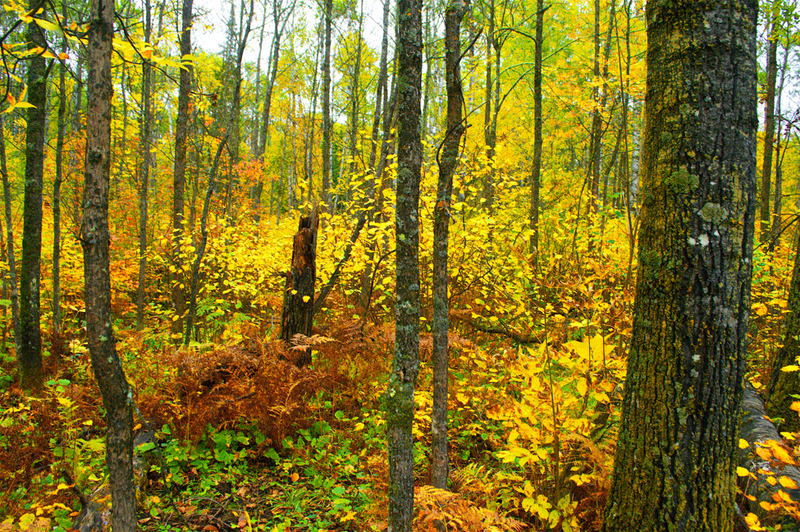 This stretch of forest, however, is unique because it has a relatively open understory which allows travelers to see through the forest (this is uncommon in the dense boreal forest of VNP). This stand is especially glorious in the spring and fall when the colors of tree buds or turned leaves glisten against blue skies. Another highlight of this section is a large, lone spruce tree right along the trail. After reaching this spruce, the trail heads north and skirts along the southwestern edge of a massive active beaver pond, which my friend and fellow wolf researcher, Austin Homkes has named “Dead Birch Pond”, due to the large quantity of dead birch trees poking out of the bog mat in the pond. The trail actually crosses just below the dam of the pond and in 2016-2017 the beavers were particularly active in this area, cutting several large balsam poplar and aspen, some of which fell over the trail. In fact, in spring of 2017, the beavers were actually using the Kab-Ash as a trail to reach trees to cut. There are some beautiful aspen and birch stand along the Kab-Ash. For another ¾ miles, the trail undulates over small rocky knolls and down into lowland forests before reaching the southern tip of Bowman Bay. When there are no leaves on the trees, Bowman Bay/Lake Kabetogama can be seen easily from the trail. After passing Bowman Bay, the trail turns swampy for about a half-mile as the terrain becomes flat, wet, and soggy. Ash lowlands predominate this stretch, with some enormous, stately cedar trees scattered about, and in the spring marsh marigolds carpet the forest floor in bright yellow. This trek through the swamp, though, is worth every muddy step because just beyond it lies the old growth forest discussed above. You will know when you reach this cathedral because right on the north side of the trail will be a towering white spruce and just beyond on the south side of the trail will be more of the ancient beasts—the pines are so much larger and taller than the rest of the trees that you cannot miss them. Take some time and revel in this natural wonder! Once passing through this old growth grove, all other trees on the Kab-Ash pale in comparison. 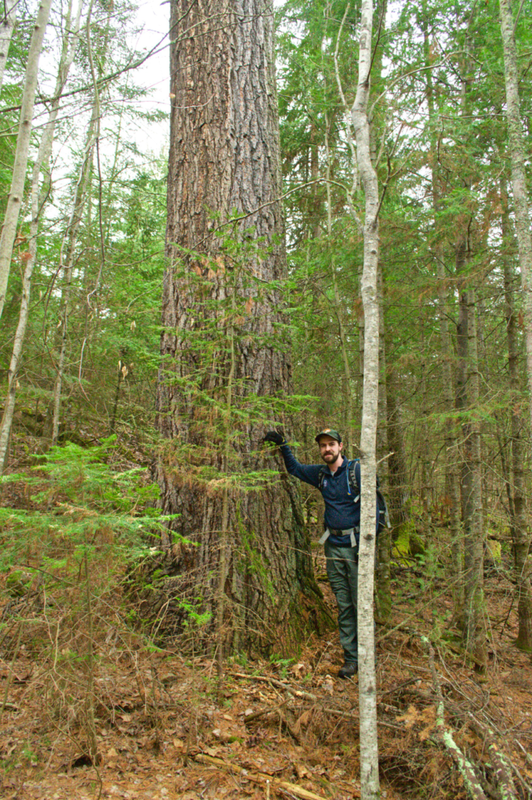 This towering old growth spruce that lingers high above the Kab-Ash marks the location of a grove of old-growth trees. Monstrous white pines can be seen in the background behind this spruce. After passing this grove, the next 2 miles go through relatively flat mixed forest habitats until reaching a recently logged area that is just outside of the park. The trail follows the main logging road used to harvest this stand of cedars. In all seasons this logging road is muddy, wet and messy, and in the summer the vegetation on the road is incredibly dense because the trail is not well-maintained in this section. I generally choose to hike on the edge of the road where it is a little less wet and the vegetation not as thick. Eventually the logging road/Kab-Ash reaches the Arrowhead Snowmobile trail, and on the other side of the trail the Kab-Ash continues as a small hiking path through the primeval-looking cedar forests. The trail crosses a drained beaver pond via a boardwalk, continues through more cedar forest, and crosses the Arrowhead snowmobile trail once again. The last mile or so of the Kab-Ash goes through thick balsam forest and the typical mixed forest habitats of northern Minnesota. The last few miles of the Kab-Ash are not the most enthralling of the trail but still have that exquisite Northwood’s beauty. If Minneapolis-St. Paul is the new 'Bold North' Voyageurs National Park is the Wild North. For a truly Minnesota winter experience, embrace the cold and venture to Voyageurs where the crisp air and fresh snow welcomes you. Voyageurs National Park is the ideal place for you to reconnect with yourself, friends and family, and the outdoors, even in colder weather. Here are a handful of the amazing experiences you can have at Voyageurs in the winter months. Immerse yourself in the tranquility of Voyageurs National Park with a day of cross country skiing. The Echo Bay Trail is located three miles from the Kabetogama Visitor Center (closed in winter) off County Road 122. This trail offers a wide path that takes you from aspens to pines as you pass through lowlands and rocky outcrops. Sections of this trail are groomed for skiing in the winter months - perfect for novice skiers - while other parts of the trail are of intermediate difficulty. Did you know Voyageurs has an official sledding hill? The Sphunge Island Sledding Hill is open and accessible from the Kabetogama Lake Ice Road complete with picnic tables and a fire ring. The sledding hill consists of a small hill for younger children and a larger hill for older children and adults. To access the sledding hill, take the Kabetogama-Ash River Ice Road from the Kabetogama Lake Visitor Center. The Sphunge Island sledding hill opens annually once there is sufficient snowfall and the ice road gets plowed on Kabetogama Lake. There's also a skating rink at the site. Spend a night, or two, or three, in the Voyageurs winter wonderland. Camping offers amazing opportunities for night sky and wildlife viewing. Perhaps you'll even catch the Northern Lights. Campsites are accessible via snowmobile, skiing and snowshoeing. Keep in mind all overnight stays at campsites within the park require a reservation in advance. You can access the reservation page by following this link. If you need some convincing, check out this compelling argument about why camping in the cold is the way to go! Discover a new way of getting around the park's ice highways! The Rainy Lake Ice Road departs from the Rainy Lake Visitor Center boat launch. The Kabetogama Lake Ice Road travels between the boat launches of the Ash River and Kabetogama Lake Visitor Centers. The speed limit is a slow and steady 30 mph. Familiarize yourself with safety on the ice roads. Ice road routes change from year to year depending on ice conditions. Contact the Rainy Lake Visitor Center for the latest ice conditions or check the park’s website before planning a trip to see which ice roads are open for the season. The Rainy Lake Visitor Center is open year-round. Stop in before you head out to explore the park to chat with park rangers, learn more about the history of Voyageurs National Park, and pick up skis or snowshoes to play in for the day. Come back through after your day of winter activities to warm up and browse the park bookstore! During the winter season, RLVC is open Wednesday - Sunday from 10am to 4:30pm. The Rainy Lake/Black Bay to Kabetogama Lake to Ash River (Green Snowmobile Trail) has been staked and opened. Please be advised that trail conditions along the lake surfaces are rough due to wind-blown snow. Several pressure ridges have formed on Kabetogama Lake and Black Bay. These pressure ridges have been marked and are safe to cross at designated crossings along the trail system. Trail users are advised to use caution when travelling across frozen lake surfaces at this time. Future winter ice and trail condition press releases will be issued only during major changes in trail conditions. By Tom Gable “When despair for the world grows in me and I wake in the night at the least sound in fear of what my life and my children’s lives may be, I go and lie down where the wood drake rests in his beauty on the water, and the great heron feeds. I come into the peace of wild things who do not tax their lives with forethought of grief. I come into the presence of still water. And I feel above me the day-blind stars waiting with their light. For a time I rest in the grace of the world, and am free.” - Wendell Berry, "The Peace of Wild Things"
Many come to Voyageurs to boat, camp, fish, or snowmobile while experiencing the beauty of the outdoors. Yet, Voyageurs is a vast area with large tracts of wild, undisturbed forests in which people rarely step foot. It is these wild places that give Voyageurs an intrinsic value outside of the recreational activities that most come to the park for. However, I think this intrinsic value of the park is rarely articulated, expressed, or appreciated. I have spent the past four years studying wolves in Voyageurs National Park as both a graduate student and then an employee of the park. Much of my work entailed following wolves. Wolves cover large distances each day. As a result, to follow and understand them, I had to do the same. Thus, I have been fortunate to have an excuse to visit and experience parts of the park that few have ever seen or stepped foot in since the formation of the park in 1975. I have been fortunate to experience the park’s true wilderness. But what is wilderness? Today there are increasingly more natural places, parks, and green spaces. While these areas are undoubtedly valuable, they are not wilderness. Many (such as Edward Abbey, Henry David Thoreau, and Sigurd Olson) over the past 200 years have discussed what wilderness really means and how to preserve it. To me, wilderness is much more a feeling than a definition as wilderness is not simply a piece of land that meets measurable criteria – though there is importance in defining wilderness so that it can be preserved. Indeed, I cannot strictly define, and often struggle to articulate, what I think wilderness is, but when in wilderness I know it. Although, the ‘feeling’ of wilderness always seems to come from the combination of solitude, silence, and the perception of physical isolation in the natural world. If one perceives that they are in a remote place, then it is wilderness. There are a multitude of scenic places in noisy areas that have exquisite physical beauty. However, because there is no solitude and silence, the experience is nothing more than what it is: a beautiful place in a noisy world. The interior of Voyageurs National Park is a seemingly impenetrable forest with hundreds of beaver ponds, bogs and lakes. Traveling through these woods is challenging and, after a certain amount of time, a person feels swallowed by the forest. Covering even short distances can be arduous and take considerable time. However, therein is the beauty. Within minutes a person feels like they are in the middle of nowhere, lost in miles upon miles of wild forest. In a short while a person perceives wilderness and gains the esthetic and emotional benefits of being in a wild place. That is what Voyageurs is to me – a place of wilderness, a place to get lost, a place of quiet, peace, and solitude. In the truest sense, my soul feels rested and quiet when wandering through the woods of the park. Here again was the silence and I thought how rare it is to know it. In the busyness of the world with all its distractions, problems, and sadness, Voyageurs National Park is a refuge from it all. For a period of time, I can step out of the human world and slip into the natural world. Each day creatures live and die, and yet there is an eternal quality to everything in Voyageurs. Over time, I start to feel and experience the fragility and resiliency of life, the changing of seasons, the rhythms of nature. During the spring and summer, the park’s treetops are invaded by thousands of singing warblers, vireos, flycatchers, and thrushes. With the coming of winter, these birds head south and different birds return from the far north of Canada. Flocks of delicately adorned white snow buntings heading south flit along the shorelines during ice-in. During the dead of winter, the soft whistle of the pine grosbeaks in the spruce trees– one of the most beautiful sounds of winter –dances across the frozen land. The vast expanse of wild forest in Voyageurs supports many of the park’s elusive year-round residents such as the wolf, the moose, the bear, and the lynx. What they do, where they go, and how they live are a mystery. I often hope to catch a glimpse of these animals when I am in the woods, but I rarely ever do. Yet to know that they are out there is enough. What pleases me most is the possibility of seeing them. Without these animals, Voyageurs would lose much of that indescribable feeling of wilderness. I recently moved to the Twin Cities to continue my graduate education. There is hardly a greater dichotomy between wilderness and civilization than going from spending every day in Voyageurs to spending every day in St. Paul. Instead of mile upon mile of untouched forest, it is mile upon mile of roads, buildings, and an endless stream of vehicles. Yet this only highlights the intrinsic value and importance of Voyageurs. The value is in knowing that, not far away, there is a vast wilderness, a place to escape the noisy and rushed world. The value is in the woods, the water, and the animals that live in the park. The value is in the possibility to perceive and experience wilderness, to sense true quiet and solitude, and to experience the seemingly eternal quality of the natural world as the busyness of life fades away. Voyageurs is a place where I feel a boundless freedom and a peace that comes with it. All income generated from overnight fees stays at Voyageurs National Park. These fees are used for the improvement of amenities at the sites which include: mooring rings, docks, bear-proof food lockers, tent pads, picnic tables, fire rings, and site cleaning. A reminder to all visitors who use www.recreation.gov, in the main search box enter: Voyageurs National Park Camping Permits or Voyageurs National Park Houseboat Permits. Voyageurs National Park staff will be conducting hazard marker and regulatory buoy removal within the park starting October 1, 2017. In addition, Voyageurs National Park reminds visitors that hunting and trapping of any type or manner is prohibited on Federal lands and all waters within the boundary of Voyageurs National Park. This includes the removal of animals that have entered the park boundary after being shot outside the park. Park rangers enforce hunting and trapping laws under Federal regulations. Park officials remind hunters to know where they are hunting. Maps showing the park boundary and area information are available at visitor centers, boat launch kiosks, and at park headquarters. Dr. Carol Johnston, formerly at the Natural Resources Research Institute in Duluth but now at South Dakota State University, recently published a book titled "Beavers: Boreal Ecosystem Engineers" summarizing the research she and her colleagues did at Voyageurs National Park on the effects of beavers on ecosystems from the 1980s to present. "This 88-year record of beaver landscape occupation and alteration documented by Johnston and colleagues from aerial photography and field work provides a unique resource toward understanding the ecosystem effects and sustainability of beaver activity." The Kabetogama Lake and Ash River Visitor Centers will be closed for the season beginning Sunday, October 1, 2017. Both visitor centers will reopen in mid-May 2018. The Rainy Lake Visitor Center will be open Wednesdays through Sundays, 10:00am to 4:00pm from October 1, 2017 through December 31, 2017. Look for winter hours soon. 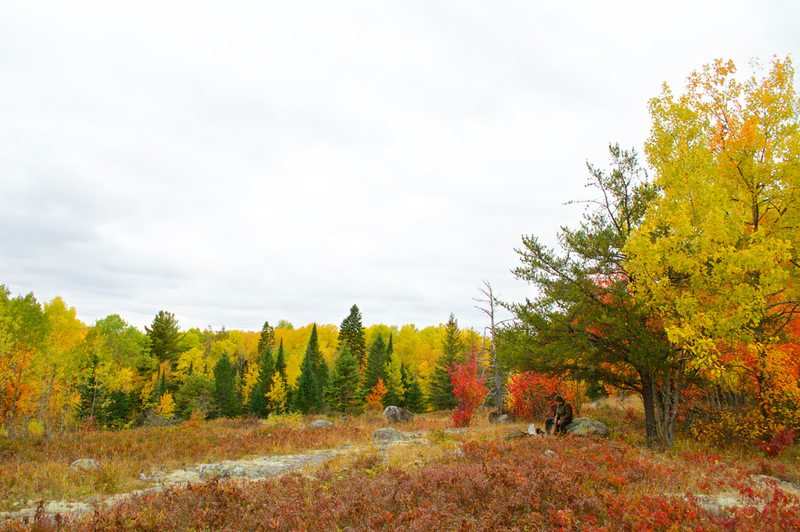 Voyageurs National Park staff encourages you to come out and explore the park this fall and enjoy the colors of the North Woods. Eric Grunwald, National Park Service It was a calm and warm mid-September day when my friend Jeff and I put our canoe in the water at the Rainy Lake Visitor Center boat ramp. Jeff is a park ranger at Grand Canyon National Park and I was excited to show him the sites of some of the most interesting historic events that took place on Rainy Lake inside what is now Voyageurs National Park. As we paddled away from the boat ramp the North Woods were in all their splendor. A loon dove under the water no more than 50 yards away and an eagle soared overhead. The very first hint of fall color shone on a few of the scattered aspens on the lakeshore. We made quick time on the calm waters of Black Bay, and before we knew it we were at the dock marking the site of Rainy Lake City. Today the city is no more than the grassy trace of an old city street. Though there are two buildings on the site, these buildings do not date from Rainy Lake City, but from a later time in northern Minnesota history. As we docked the canoe and headed into the forest, there seemed to be more going on in Rainy Lake City than met the eye. We walked the trace of what had been one of the town's streets and I told Jeff a little bit about the town's history. In 1894 a small town, perhaps as large as 500 inhabitants, grew at the site where we walked. Rainy Lake City held many of the conveniences that one would expect in a town of the mid-1890s. Very early on in its existence Charles W. Moore wrote that the town has "eight drygoods stores, as many groceries, three hotels and restaurants, two newspapers, one livery barn, three laundries...one doctor and one lawyer." Perhaps L.D. Chadbourne described the scene at Rainy Lake City best when he wrote in 1894 "the population of Rainy Lake City is 214, eleven of whom are females... there are places where you can get whiskey at 15 cents per small glass; or play any kind of robbers game that you are looking for." Chadbourne concluded by writing "Every branch of business that is needed in a new town is well represented, especially the saloon business. There are only 16 saloons at present, but the people have faith there are more to follow." There must have been a wild and transient atmosphere to the town, and just like many of the towns that sprang up overnight in the American West, the reason why Rainy Lake City was developed was to support the mining industry, in this case the only gold mines in Minnesota. We walked the grassy road trace to the point where it seemed to disappear. Then, we turned around and started to make our way back to the canoe. As we walked, I swear I could almost hear the muted laughter and conversation of men drinking and playing cards. "This must have been quite the place in the 1890s," Jeff said to me as the canoe came into sight. Before we left Rainy Lake City we decided to head into the old log building that's left unlocked for visitors to explore. I went on to explain to Jeff that the building that we were inside does not date from the Rainy Lake Gold Rush of the 1890s, but to a later date, the Prohibition Era of the 1920s. It is what was called a "blind pig" or speakeasy where patrons could get alcohol even though its sale was illegal. It seems even though Rainy Lake City was largely a ghost town by 1901, people were still drawn to the seclusion of the site well into the 20th century. We got back into the canoe at the dock and started to make our way west on Rainy Lake. We had yet another destination in mind, the only Minnesota gold mine to ever turn a profit on Little American Island. While the winds had been calm on Black Bay, we were less sheltered now that we were on more open water. It is incredible how a wind as light as 5 miles per hour can make paddling more difficult. A few fishing boats passed us as we made our way to the north side of Little American Island and the dock for the trailhead. Little American Island marks the site where, in 1893, prospector George W Davis gouged out a sample of quartz from a vein on the island. The quartz sample was sent to Duluth to be assayed, or tested for gold, and sure enough the test showed an average of about $98 worth of gold per ton of ore. Quickly, a party of men paid $10,000 for the island. Jeff and I docked the canoe and walked to easy gravel trail to an old horizontal mine shaft, called an adit, now partially filled with water. We continued on the trail to the site of a vertical mine shaft. Besides the mining shaft, a pair of adits, and a large metal wheel, not much evidence remains of the mining operation on Little American Island. Due to the high costs of mining and processing ore, and poor management, mining activity at Little American Island did not last long. In early 1898 all mining operations ceased there and the property was soon seized by the Itasca County Sheriff. Our last stop on the island was an overlook of a portion of the Rainy Lake gold field. Not only does the site offer a wonderful view of Rainy Lake and islands dotted with boreal vegetation, it also includes an interpretive panel complete with a map of other mining sites that are now within the boundary of Voyageurs National Park. With names like Busyhead, Big American, and Hope-Still; each site seemed to beckon us to explore further. Alas, the wind was starting to pick up, and Jeff and I did not want to get stranded, unable to make headway in strong winds. We opted to paddle the canoe back to the boat ramp near the Rainy Lake Visitor Center. As we made our way back to the boat ramp, Jeff and I talked about all we had explored that day. We agreed that while in the 1890s men had seen value in the gold locked up in the rocks of what is now Voyageurs National Park, there is still great value in these lands and waters. Today the value lies not in material resources, but in the scenery of the North Woods, the animals that inhabit the area, the opportunity to canoe or motorboat on waters that were once plied by the voyageurs as park of a wold-wide trade network, and the idea that all of it will be preserved not just for us, but for future generations of visitors to northern Minnesota. Learn more about Little American Island by listening to this podcast. VNPA couldn’t be more excited about their experience, ideas, wisdom, and passion for Voyageurs National Park. Sharon Oswald has worked in Minnesota’s nonprofit sector and government relations for over 20 years, primarily dedicated to public health. She currently works with Delta Dental of Minnesota as a foundation program manager, and enjoys nature and helping protect Minnesota's outdoor heritage. Jim Bizal has extensive experience serving on several boards within his community and has spent the past 25 years exploring Voyageurs’ Sand Point and Namakan Lakes with his family. When Jim isn’t spending time with his family or giving back, he runs a home remodeling business in Edina, Minnesota. Megan Bond has been active with VNPA since 2012 in a variety of roles including committee member, volunteer, and policy coordinator. Megan earned her Juris Doctor degree and masters in public policy at the University of St. Thomas. She lives in International Falls enjoying all seasons on Rainy Lake and working as a judicial law clerk. If you’re attending the fall member breakfast, be sure to introduce yourself to our new board members. Full list of 2017 Board of Directors. If you are interested in exploring committee or board service, please contact our board chair, Jeffrey Brown via vnpa@voyageurs.org. Voyageurs National Park Association’s mission is to connect people to Voyageurs National Park, enhance the visitor experience, and protect the park for present and future generations. VNPA is the park’s nonprofit partner, serving as the leading voice for protection and outreach, providing financial and volunteer support for recreation and conservation projects, and working together with the National Park Service to preserve the visitor experience and wild nature of Voyageurs for future generations. The first public comment period on the study of risks to the Boundary Waters region from sulfide-ore copper mining ended on August 17. Here’s a quick video explaining the process. Over 126,000 comments were submitted. That's a record high level of public engagement in any environmental review process in Minnesota and further shows the importance of protecting the BWCAW and Voyageurs from this threat. Read the comments VNPA submitted to the Forest Service and thank you to those who submitted their own. This recent comment period helps to launch a two-year science-based environmental review of the region’s unique water-based ecosystem and will help determine if the Rainy River watershed is the wrong place for sulfide-ore copper mining. Voyageurs and the BWCAW are national treasures, of immeasurable value to people in Minnesota and across the United States. Clean water is the foundation of Minnesota’s natural heritage. Voyageurs National Park Association fully supports this two-year environmental review which is essential to allow federal agencies and the public to examine the science.